Singing or playing womb-like sounds in the neonatal intensive care unit (NICU) may help slow the heart rate and improve sleep and eating patterns of premature babies, a new study suggests. Researchers found infants who had respiratory distress or sepsis tended to do better while listening to their parents sing a lullaby or to sounds mimicking a mother's heartbeat or fluid in the womb. "We are learning from the literature and studies like this that premature infants do not necessarily grow best tucked away in an incubator," said Joanne Loewy, head of the Louis Armstrong Center for Music and Medicine at Beth Israel Medical Center in New York. "Neurologic function can be enhanced with music; vital signs can be enhanced through interactive sounds and music therapy," she told Reuters Health. 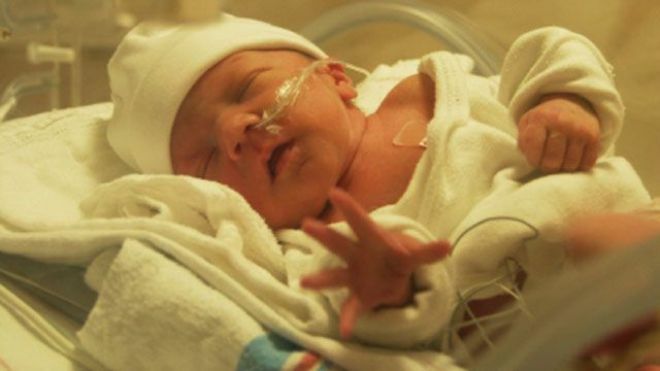 Her new study included 272 preemies being treated at 11 NICUs that had music therapists. At different times over two weeks, babies' parents sang to them or therapists used one of two devices meant to simulate womb sounds for 10 minutes. Loewy and her colleagues compared preemies' vital signs during those periods, as well as their eating and sleeping, to times when no sounds were played. They found the babies' heart rates dropped by one or two beats per minute, on average, while they listened to the lullaby and heartbeat sounds and just after they'd heard other womb-like sounds. "The singing is extremely important because it represents familiarity - the baby heard the mother and father's voice as early as 16 weeks," Loewy explained, "plus you have melody and rhythm in song." Sucking rates sped up with the heartbeat sounds, in particular, and there was a longer-term improvement in sleep patterns tied to the womb-like fluid noises, the researchers reported Monday in Pediatrics. Previous research into the soothing effects of music has found mixed results among both babies and, for example, adults on ventilators in intensive care. There were no babies in the new study who were exposed only to silence or quiet talking in the NICU, so the researchers can't say how these preemies would have compared to a no-music group - only that they did better while hearing music. They said the sounds used in these NICUs can be replicated by parents without the help of a music therapist, if one isn't available. "The wonderful thing about these instruments is that the body can take it over," Loewy said. "We teach (parents) to hold the baby over the heart, to hold them skin-to-skin, to make ‘ahh' sounds to enhance that womb-like atmosphere." Loewy said she and her colleagues especially encourage parents to sing songs that are important to their family and culture, which can ease their stress as well.